This is quite an old range. I got replacement drip bowl an element from home depot. The labels said “fits most GE models”. The 6” bowl and element fit but the 8” pair were about 1/4 of an inch too big. Will this fit my old range. Hello Ellen, Thank you for contacting us. I have researched the model you have provided and have found the part you’re looking for is PartSelect Number PS244697 for the small bowl and PartSelect Number PS244696 for the large Bowl. The Small Element is PartSelect Number PS244017 and Large is PartSelect Number PS244016. Thank you for your inquiry, good luck with this repair! 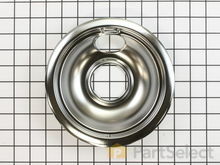 Related Parts: Surface Burner - 8" - 2100W Surface Burner - 6" - 1250W Drip Bowl - 6"
Easy installation - great part! The drip bowl came fast and arrived in great condition. It installed easily and my stove is back in clean working condition. A perfect fit for our old Kenmore electric range. Helped with the annoying tilting and uneven cooking surface. 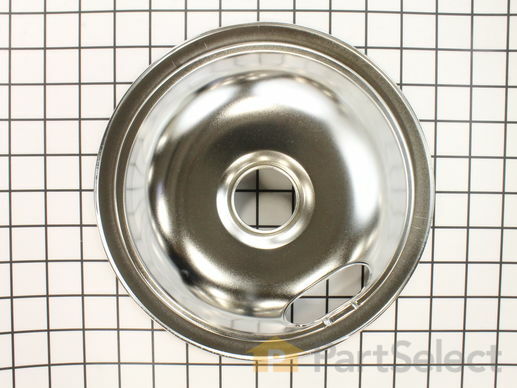 I think the drip pans I bought are of good quality and hold up better than some that are less expensive. Have used others that didn't appear to be of the quality these are. This part fit perfectly. Easy install.